The Professional Fire Fighters of Wisconsin Charitable Foundation reduces risk and enhances the work fire fighters do both on and off duty. Over the last several years we have supported initiatives throughout the state through small grants, sponsorships, donations, and more. If you are interested in applying for a grant or a donation request, please fill out the application linked below. Grant deadlines are March 1st, June 1st, September 1st and December 1st. All grant requests must be submitted electronically. No hard copies will be accepted. Keep your grant request clear, simple and concise. You may include annual reports, but it’s not necessary. No grants will be accepted for consideration after the deadline dates. Decisions on all requests will be made by the end of the following month, and checks will be mailed to those receiving grant money. You must be a registered non-profit to request a grant. We generally give to smaller agencies with less than a $1M annual budget. We give to local needs, —- in Wisconsin communities we serve. Generally we do not fund out-of-state requests. Priority is given to non-profit agencies with a connection to the Professional Fire Fighters of Wisconsin Charitable Foundation, the Fire Service Community, or to our programs and services. We give to specific projects, programs, and new initiatives, not to general operation or annual budget. We favor proven programs with a successful track record, —or new, creative initiatives that will address unmet needs. We generally do not give to the same agency for multiple, successive years. At this time in our history, we generally are able to give grants in the range from $100 to $5,000, although we are willing to consider proposals below or exceeding those amounts. Please answer all the Grant Request Questions in our GRANT APPLICATION. We recommend answering questions in a Word document first and cut and paste them into the grant application when you are ready to submit the application. Include any documents, (.pdf, .doc, .jpg only), not to exceed a combined total of 10mb. Our grant application is based on the Wisconsin Common Grant Application from the Wisconsin Philanthropy Network. Please use the link for questions about the application. 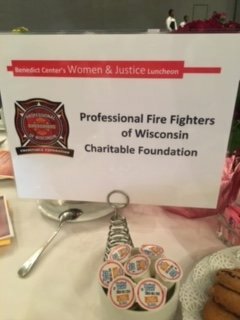 How did you hear about the Professional Fire Fighters of Wisconsin Charitable Foundation Foundation. Thank you for the good work that you do to make the world a better place for everyone.